Cricket Depth: Leg spin – a dying art or just a blip? Leg spin – a dying art or just a blip? As this article is being written, England are hosting West Indies at Lords in the opening test match of the English summer. What may have gone unnoticed though, is the lack of leg-spinner in either squad; something of a common theme throughout cricket in recent years. Go back 10 years and the likes of Shane Warne, Mushtaq Ahmed and Anil Kumble were at the height of their powers; they consistently left quality international batsmen trudging back to the pavilion, bewildered by the mystery of leg-spin. And it wasn’t just the revolutions on the ball which caught the eye; these spin-bowling masters had something which you’d be hard pushed to find in international cricket nowadays – charisma which conjured excitement in spectators each time they were called upon to bowl. The fascination was brought about by the obscurity of leg-spin. Which way was the ball going to turn? The names mentioned earlier had a number of deliveries in their armoury – the traditional ‘Leg-break’, the ‘Googly’ and the ‘Topspinner’. 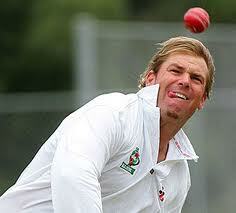 Shane Warne even made a variant of the latter, christening it the ‘Flipper’. But it wasn’t this ball that he made his name with; with his first test match ball against England during the Ashes series of 1993, the magical Australian dismissed Mike Gatting with a delivery now known as the ‘ball of the century’ – bowling the English captain around his front pad with a leg-break. Warne retired from international cricket in 2007, four years after Mushtaq Ahmed, and followed a year later by Kumble. So where are their successors? There is currently only one leg-spinner playing consistently on the international stage – Pakistani born, South Africa player, Imran Tahir. He is now ‘carrying the baton’ for leg-spin so to speak, but even he is now reaching the twilight years of his career. Tahir has played first-class cricket since 1998, but didn’t make his debut for his country until 2011, at the age of 32. The reason for Imran Tahir taking such time to break through on to the international stage is the same cause for so few quality leg-spinners being around in the modern game – it is the most difficult spin to master and coaches would rather not take the risk of a nurturing a player who bowls it. This attitude starts at club level cricket. With more limited-overs cricket gradually being introduced, it is now becoming just as vital to stop runs being scored than to take wickets – something which leg-spin bowling doesn’t always adhere to. Okay, a ‘leggy’ may go for a few runs, but they’re also very likely to take wickets. However, despite Tahir being a lone figure in test cricket currently, England do have two exciting leg-spin prospects emerging; Adil Rashid and Scott Borthwick. Both have had some experience of the senior international stage, taking part in 7 ODI’s for England between them. Rashid, aged 24, has played 82 first-class matches for Yorkshire – taking an impressive 271 wickets. Borthwick is two years Rashid’s junior, and has 61 dismissals to his name in 28 matches. Both performers are being tipped as future England stars. Whether it is simply a lack of talent currently or a shortage of desire to bowl leg-spin, international cricket is certainly missing the star names mentioned in the opening to this piece. Let’s hope fortunes change and coaches strive to re-introduce quality leg-spinners into the game. In 10 years’ time, the likes of Adil Rashid and Scott Borthwick could leave us saying Shane who? Fingers crossed, and wrists spun!